Here’s a final note about setup before we get going: make sure you have a DHCP scope configured for your thin clients. Common sense, right? It took me longer than I care to admit because I had placed my thin client in a different subnet than the scopes I had configured. Obviously, once I added a scope for this subnet, my thin client started pulling an IP address. Towards the end of my studying for the VCP5-Desktop exam, I decided to look into using some old laptops and PCs I had lying around as thin clients. Searching the web, I ended up settling on and wresting with Thinstation for a couple days. As one of the few, free, thin client options, Thinstation is probably the most stable and most up to date software available. This post shares the efforts I put into getting it running in my home lab. My end state goal is to touch the thin client as little as possible before working from a View desktop. So my vision, then, is to PXE boot the end point, let it download the thin client OS, and have it auto-launch a View desktop client. From there, a user could enter credentials and log in. There are a few ways to get Thinstation working in a PXE boot environment. 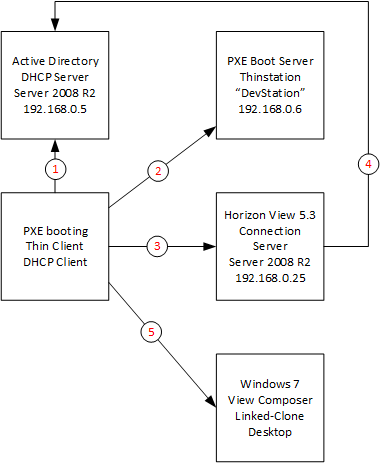 The overall idea, no matter how you go about it, is that you have to use a development station to build the thin client boot image that will be downloaded to your thin client hardware via a PXE boot infrastructure. There are no good materials on the intertubes to follow in a step-by-step fashion for this setup, so here’s my attempt at the first such walkthrough, as far as I can tell. After implementing Cisco Nexus 5ks that include native Fibre Channel switching for shops that usually don’t have dedicated SAN guys, I’m often called up sometime later to offer a refresher on how to add zones. I usually share this tidbit via email, but here it is for the internets. These commands are very similar on newer MDS models, as well. I was cleaning up a client’s /etc/rc file yesterday while preparing to move some IP addresses to different interfaces and I noticed they had configured the vMotion network as a VLAN interface on both controllers. This isn’t right because the vMotion network only needs to exist between ESXi hosts – the storage array never touches the traffic. Storage vMotion doesn’t use the vMotion network either. It uses the storage network, whether IP- or FC-based.